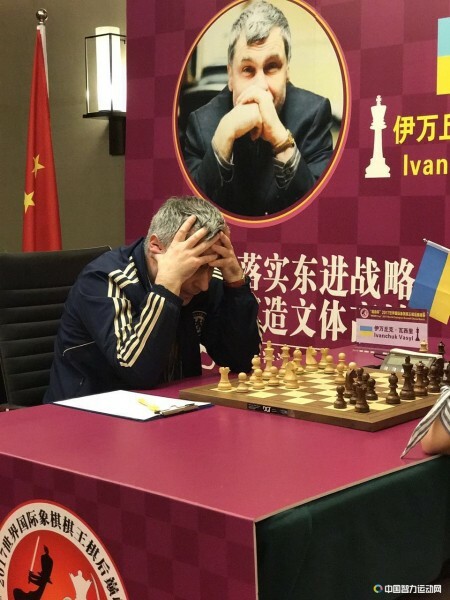 Vassily Ivanchuk won the World Rapid Championship at the turn of the year, recently beat Hou Yifan in a match and will play in the Capablanca Memorial later this month. In an interview with the Ukrainian Sport-Express he talked about his victory in Doha, how he now combines chess tournaments with checkers, his problems with losing on time and which of the World Champions he would most like to meet. 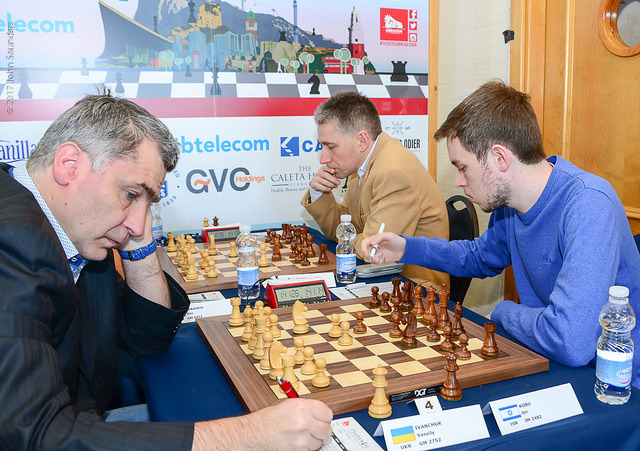 Who plays better, Ivanchuk in good form or Carlsen? 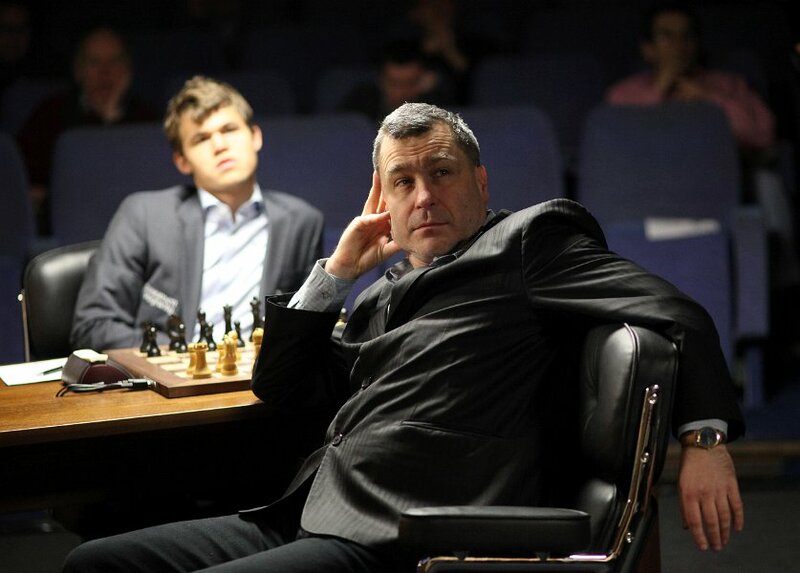 It seems to me it’s Ivanchuk in good form. 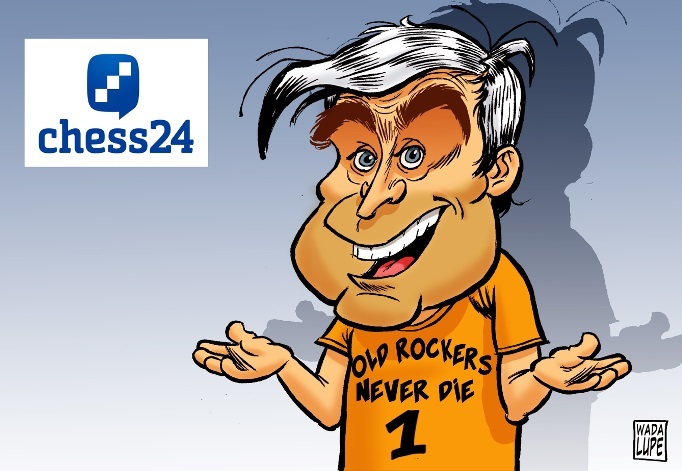 Ivanchuk: Of course rapid and blitz differ from classical chess. However, that in no way means that rapid and blitz games can’t be interesting and full of ideas. In both games against Carlsen to a certain degree I managed to catch him out in the opening. In the first game I somehow immediately managed to seize the initiative. In the second, after playing a novelty, I got a pretty good position. However, I then slightly spoiled it and the advantage was already on my opponent’s side, but Magnus played the endgame badly and I managed to win. The special feature of such events is that it’s very hard to play the whole tournament at the same level. Everyone, including me, had both wins and losses. Mental resilience is then of no small importance. If you suffer some kind of loss you need to get over it as soon as possible and get ready to play the next game with maximum concentration. Ryzkov: Probably all chess fans saw the closing ceremony on the internet when you were given your prize in Doha and noticed that you were almost late for it because you were playing… checkers. Is checkers a serious passion for you or no more than a hobby that lets you get away from the stress of chess battles? For now it’s hard for me to say. I’ve taken part in checkers events and plan to continue doing so, but I don’t know what kind of success I’ll manage to achieve in checkers. I would like, however, to make progress and become a master. When I travel to checkers tournaments I prepare for them seriously. I can put it this way: it really interests me. You didn’t play in the Chess Olympiad in Baku last year. Will we see you in the Ukrainian team in future? Of course, I’m still planning to play for the Ukrainian team at the biggest events. Among all the tournaments around can you single out your favourites? One of my favourite tournaments is the Capablanca Memorial in Cuba. I also really like the Frisian checkers tournament (the game takes place on a 100-square board, while the main difference between that and international checkers is that you’re obliged not only to take your opponent’s checkers diagonally but also vertically and horizontally) in the Dutch town of Franeker. The games are played on a boat (the town lies on the Van Harinxma Canal), and the final round of the event takes place in the old town hall built back in the late 16th century in the Renaissance style. At the start of the year at the renowned Gibraltar tournament in the 2nd round something unforeseen took place: with an excellent position you made a single move less than you needed for the time control, your flag dropped and, as a consequence, you lost. You know, there was something mystical about that! Playing in the 1st round against Hungary’s Petra Papp I missed one of the lines on the scoresheet. My opponent noticed, but didn’t say anything, deciding it would be awkward. However, there was no time trouble in that game, and that oversight had no influence on the future course of events. But in the next game against the Israeli chess player Kobo Ori I did the same thing! I can’t explain how that happened. At the critical moment I thought I’d already made 40 moves and calmly thought about my next move. At that event they were using very unusual clocks. Until the time shown reaches zero, it doesn’t matter how many moves you’ve made – 40 or more – the additional time doesn’t show up on them. I somehow overlooked that fact. I had a big advantage during the game. I wasn’t 100% sure the game was won, but I had a choice between giving a check with a rook and making a quiet move with the same piece. I sank into thought over which of those alternatives was better. Having made the move, I got additional time (while, as a rule, when you lose on time you see zeros on the clock), and I didn’t suspect anything was up. Ori Kobo, however, called over the arbiter and pointed out my mistake. I was amazed. The additional time was showing, so how could I have lost on time? However, it was explained to me that it was a feature of those clocks. So in the end I suffered that loss. And your opponent feels like a conqueror – he beat Ivanchuk! Ori Kobo acted according to the rules. There can’t be any criticism of him at all since he didn’t break any rules. I remember the Candidates Tournament for the World Chess Championship where you lost a series of games on time. There I somehow failed to adapt. Up until move 40 there was no increment, and that posed a problem for me. As a professional I should have paid attention to that before the tournament began. However, encountering that problem even during the tournament I somehow forgot about it. Of course, from a professional point of view such explanations sound a little surprising, but during play I was so distracted by the search for the best ideas, the best moves, that the time factor - seemingly secondary, but extremely important from a sporting point of view – took a back seat for me. And as a result that cost me a few points. It follows that you should follow the clock! I want to give that advice to anyone who plays chess (smiles). Which World Champions of the past would you be interested in playing? I respect all the holders of that highest of chess titles, and I’d be interested in having chess encounters with all of them. However, if I had to choose one, then I’d like to play Bobby Fischer. It would be interesting to feel the spirit of rivalry with that man at the chessboard and to come up against his specific chess style. How many foreign languages do you know? Can you compare the current popularity of chess to its popularity in the 1980s? The internet now boosts the popularity of chess. It’s very convenient to watch tournaments and matches online. You can quickly find the necessary information and make progress by making good use of computer programs. In the 1980s as well chess was very popular in the USSR, and in Hungary, and in Iceland. I wouldn’t say that there’s currently less promotion of chess than three decades ago, it’s simply that the popularity is expressed a little differently. The perception has changed. Previously it was essential to listen to the opinion of an authoritative chess player about the position on the board, while now you get an instant computer evaluation of the position. You could say the modern authority is the computer program Houdini. Mikhail Botvinnik was a Doctor of Physical and Mathematical Sciences. Does a non-chess education, academic degrees, help a chess player? In any case, they do no harm. The Dutch World Champion and for many years FIDE President Max Euwe was a maths professor, Fedir Bohatyrchuk was a radiologist and professor of medicine, the German Grandmaster Robert Huebner is a well-known papyrologist, studying texts written on papyrus and in ancient languages. Britain’s John Nunn is a Doctor of Mathematics, who already at the age of 15 was a student of Oxford University – incidentally, he was the youngest student in Great Britain for 400 years! Alexander Alekhine was a Doctor of Jurisprudence. Of course education, general development and general culture is useful for chess players. What upcoming tournaments can we root for you in? At the end of May/start of June I’ll definitely take part in the Capablanca Memorial in Varadero, in Cuba. In September I’m planning to play in the knockout World Cup in Tbilisi, but I can’t entirely rule out that I’ll play in some tournaments before that. I’m trying to compose my schedule so I can play not only chess but also checkers tournaments.